The Leading Provider of Flexographic Printing Plates for Medical Packaging. 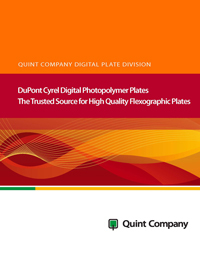 Quint Company has been supporting companies in producing medical packaging for over 25 years. Our expertise in FDA-compliant bar codes is unsurpassed. In fact, we wrote the “book” on quality assurance: our proprietary 200-point checklist that ensures that every plate and every bar code we produce will meet or exceed our clients’ requirements. Today, we remain an industry leader in introducing innovative systems and processes, and we continue to be a true partner to our clients. We work with them to achieve their goals and solve their packaging challenges. We hold ourselves to the high standards of the pharmaceutical and medical device industry. To address the requirements of our pharmaceutical and medical packaging clients, the Quint Company Pharmaceutical Division operates a cGMP-like environment. We maintain full standard operating procedures (SOPs) to support the level of quality our clients expect. We have been audited and chosen as an approved supplier by many leading pharmaceutical manufacturers. We’re pioneers in the use of bar coding on medical packaging. For nearly two decades, Quint has been involved with the FDA Bar Code Regulation. We’ve worked with the Uniform Code Council (UCC) to understand the various standards and applications of the new GS1 and Composite Symbology, and we’ve implemented SOPs to give us the control required to manufacture printing plates that comply with FDA requirements. We’re the experts in in-line single-unit-dose printing. Our team has the experience and expertise to guide engineers and technicians through initial start-ups and new product launches. Through our strong working relationships with printing equipment manufacturers, we stay on the forefront of the latest printing technologies. Consequently, we excel at matching the correct graphical treatments and printing plate materials to the equipment and substrate used—ensuring optimal print results. We have industry-leading facilities and processes. At our 30,000-square-foot facility, we have extensive state-of-the-art electronic graphics and high-resolution film output devices. We’ve made major investments in redundant equipment to virtually eliminate downtime. And we maintain a unique and secure Master File System with a separate Master File for each drug we have supported. This system allows for fast turnaround times without sacrificing repeatable accuracy of all of our blister, unit-of-use, and medical packaging printing plates. Contact us today to learn more about how our pharmaceutical industry expertise can benefit your company.